News from LMCU: Thank You for Making LMCU the #1 Mortgage Lender in Kent County! Thank You for Making LMCU the #1 Mortgage Lender in Kent County! In 2011, LMCU financed over $300 million in mortgages in Kent County, more than any other bank or credit union! * The reason for our success is the hard-working and dedicated mortgage professionals at LMCU who actively listen to customer’s needs and then take the uncertainty out of the buying process by providing the right mortgage program. Another factor is the historically low mortgage rate environment, making now an ideal time to buy or refinance a home. If you’d like to experience why LMCU is #1 in mortgage lending, call us at (616 or 800) 242-9790, or stop by any branch location, or visit us online at lmcu.org/mortgage. 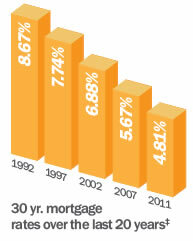 *Source: CoreLogic, total market mortgage volume in 2011. ‡Source: Federal Home Loan Mortgage Corporation Weekly Prime Mortgage Market Survey.